If you want to enjoy everything the community has to offer, the Cottage District just may be for you. Located about 6 blocks to the beach and centered around the community’s top-ranked Tennis Center, this lively area has a lot to offer active families. This tastefully decorated home is located in the coveted cottage district, right next to the tennis facility and just down the street from many of the major WaterColor amenities. Browse photos and give us a call to reserve your next stay! Stunning 4 bedroom 3 bathroom home in the Cottage District of WaterColor. This 2000 sq/ft home is beautifully decorated with a neutral palette of khaki, white and black and natural woods and woven window coverings bring out it's casual beach elegance. 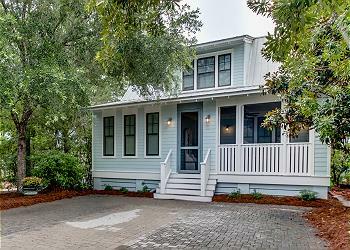 36 Lyonia is a 4 bedroom, 3 bathroom home in WaterColor's Cottage District. This quaint cottage can accommodate up to 10 and has a great porch space that is ideal for relaxing and lounging around on those hot summer days!